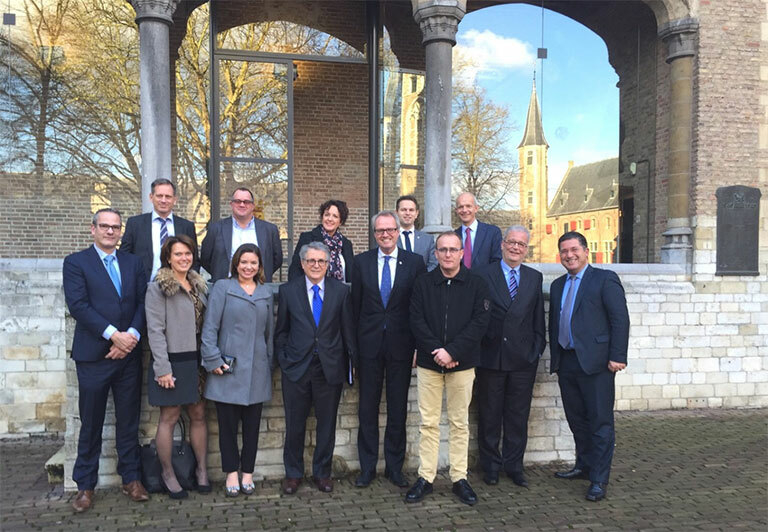 Visit of His Excellency, Mr. Piragibe Dos Santos Tarragô, Ambassador of Brasil in The Netherlands, to the province of Zeeland. November 26th, 2015. 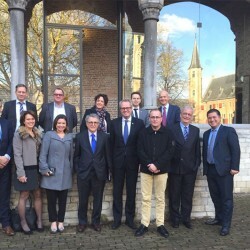 An Official visit of the Brazilian Ambassador took place in the province Zeeland, in the Netherlands, aiming to highlight the good economical practice and diplomatic relationship between these two countries. The Ambassador, Mr Piragibe dos Santos Tarragô, accompanied by his Senior Trade Attaché Mr. Ivens Signorini Filho were welcomed by the king’s commissioner Mr. Han Polman and the Provincial Executive of Economic Affairs, Mr. Jo-Annes de Bat, together with representatives of a selection of important Zeeland companies (including OOS International), to the Middelburg Abbey (The Abbey of our Lady). The origins of the Abbey go back to the early twelfth century or earlier and was renamed as the ”Hof van Zeeland” and taken over for use in the secular administration of the province. In 1812 the former abbey complex became known as the “Province Building” (“Provinciehuis”). OOS International has shown not only our work in Brazil but also our Social Responsibility commitment projects nationally, regionally and overseas, especially in Brazil. His excellency Mr. Tarragô was delighted to hear OOS International goes beyond business relations and enthusiastically confirmed the Brazilian Embassy support and cooperation on extending our business plans in Brazil, inviting our company for a visit to The Brazilian Embassy in The Hague, in the Netherlands, and showed interest in visiting our headquarter in Serooskerke. Mrs. I.M. (Ella) Teirlinck, staff member Protocol & Cabinet of the King’s Commissioner.